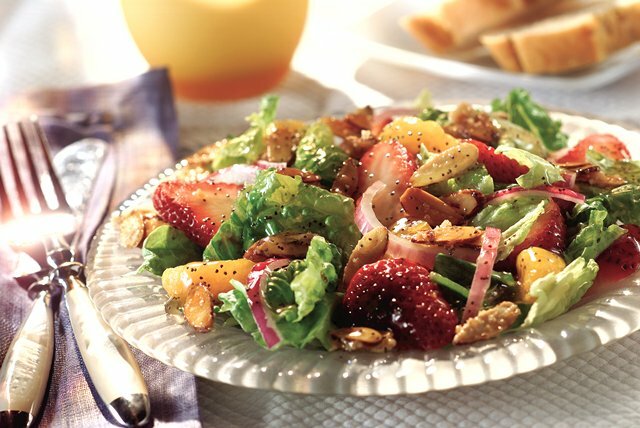 Put a delicious twist on a Strawberry Salad with caramelized almonds and mandarin oranges. This Strawberry Salad is ready in just 15 minutes. Toss lettuce with oranges, strawberries and onion in large bowl. Add Poppy Seed Dressing; mix lightly. Serve immediately. Serve with a whole wheat roll. For a quick main-dish salad, add 1 pkg. (6 oz.) OSCAR MAYER Deli Fresh Grilled Chicken Breast Strips.